Every company has a list of leads who, at some point in the past, were interested and engaged with their company, but have since gone cold. Is it worth it to attempt to re-engage those leads and rekindle the relationship? In many cases, the answer is yes, and there’s a recent report that shows 65% of marketers (B2B and B2C) believe that email marketing is one of the most important ways to reach customers. Additionally, the report shows that over three-quarters of those surveyed believe that the effectiveness of email is remaining stable or improving. 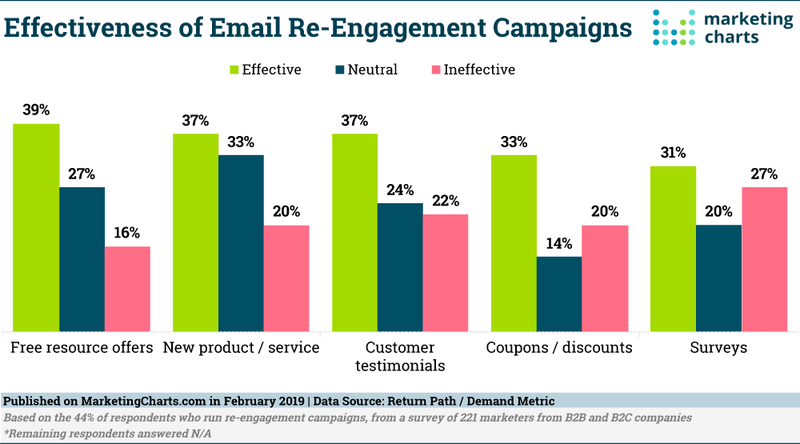 The report goes on to include which types of re-engagement emails are proving to be the most effective, with free resource offers coming in first with 39% of marketers saying this type of campaign is effective. The four other types of re-engagement campaigns that are mentioned – new product or service alert, customer testimonials, coupons or discount codes, and surveys – were all in the same ballpark, ranging from 37%-31% respondents rating them as effective. Those numbers show that marketers are seeing about the same amount of positive results with each of the email re-engagement campaigns. So, it’s definitely worth your time to reach out to those leads who you haven’t heard from for a while. To help you do that, we have five best practices for marketers to use when creating effective re-engagement campaigns, but first let’s look at why re-engagement is important. Why is Customer Re-Engagement Important? While there is a natural customer turnover that happens to all businesses, and it’s important to determine when to stop chasing “cold” leads that are never going to convert, re-engagement campaigns offer one of the highest ROI opportunities in marketing. In fact, one of the most important reasons to try to re-engage customers is that the cost of acquiring new customers can be four to six times more than retaining your old ones – even the inactive ones. That’s why you should read on for our best practices for re-engaging customers with email marketing campaigns. Personalization: You have to do more than simply importing a name from your database. Customers, whether individuals or businesses, want to feel like the messages you are sending them are unique to them – that you are interested in meeting their specific needs. That means that the personalization you employ has to go deeper than just mentioning a name. Find ways to show that you know each customer and that you want to meet his or her needs. Segmentation: The first step to successful re-engagement campaigns is segmentation. That means you should be using segmentation to increase engagement. How to best segment lists may differ depending on who you are targeting (businesses or individuals). According to the report mentioned above, 55% of B2B marketers said they most frequently segmented their lists by job title, while 49% did so by demographic. Triggered messages: Some re-engagement emails in your campaign should be set up to be sent automatically when triggered. For example, a click on a discounted offer should trigger a different email than if someone clicks on a piece of content, or on an abandoned cart link. Those messages can be automated, but still need to be personalized as discussed above. Sending frequency: The frequency with which you send out emails for your re-engagement campaign is very important. To be effective, email re-engagement campaigns most often require a structured series of emails rather than just one single message. Your timeline for re-engagement campaigns should be neither too long nor too short, on a timeline of weeks or at most, a couple of months (for example, a 30/60/90 day schedule). Metrics: Tracking the right metrics is key to evaluating your email re-engagement campaigns. You have to know which emails are being opened, when, and by whom in order to understand the effectiveness of your campaign. Email re-engagement campaigns are an effective piece of your email marketing strategy. While it’s true that some of your inactive leads might just not be that into you anymore, there’s a very high likelihood that others will respond positively to your re-engagement campaign. Taking the time to utilize the best practices above and creating targeted campaigns will win back some of those customers that you thought you wouldn’t hear from again.